The jewel of the Redang Marine Park, this island is surrounded by diving heaven: waters filled with green and hawksbill turtles, groupers, moray eels and more. Redang is one of nine protected islands that make up the Redang Marine Park, off the east coast of the Malaysian Peninsula. The island is covered with jungle and surrounded by crystal-clear waters teeming with marine life. Pull on a face mask and dive into an underwater world filled with brilliantly colored reef fish and bright corals. Scuba divers can explore World War II wrecks, now a habitat for groupers and moray eels. For a different perspective, take to the waters in a rented sea kayak and enjoy incredible views back to the island. The most popular activities on Redang are sunbathing on the white-sand beaches, swinging in a hammock beneath the palms and floating through the azure waters. If you do drag yourself away from the beaches, follow the jungle trail that crosses the island, keeping an eye out for monkeys, and then catch a boat back to your resort. Climb to the peak of Bukit Besar Mountain for a breathtaking view over the whole island and the surrounding waters. Have your camera handy at sunrise and sunset for postcard-perfect moments. Accommodation on the island is mostly resort style, with upmarket camping providing an alternative option. Many resorts include snorkeling trips in their packages, while others offer relaxing spa treatments. Dining at the resorts ranges from buffets to barbecues, while nearby restaurants offer both Western favorites and local fare such as keropok lekor (fish sausage) and curried fish heads. Take bottled water with you, or buy some on the island, as most tap water is non-potable. Flights run daily from Kuala Lumpur to Redang Island, and ferries and speed boats run from Merang on the mainland. Note that resorts close during the monsoon season, which is from the end of October to the beginning of March. 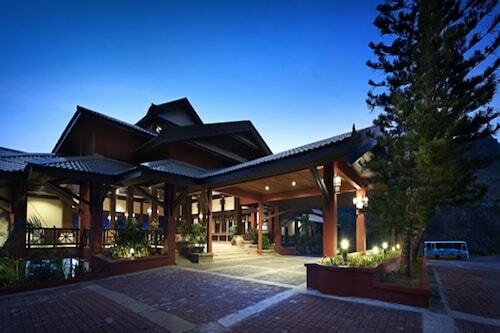 Situated in Redang Island, this hotel is within a 15-minute walk of Redang Mosque and Berjaya Beach. Marine Park Centre is 2.4 mi (3.9 km) away. 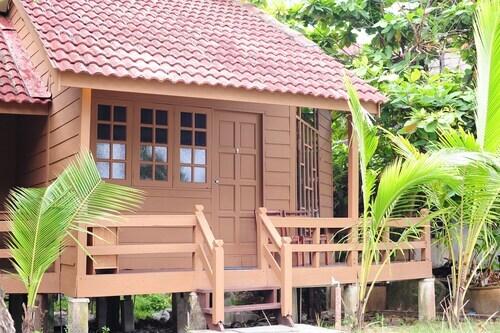 Nestled on the beach, this Redang Island resort is 0.1 mi (0.1 km) from Redang Beach. Offering direct access to the beach, this Redang Island hotel is 0.1 mi (0.1 km) from Redang Beach and 3.1 mi (5 km) from Marine Park Centre. 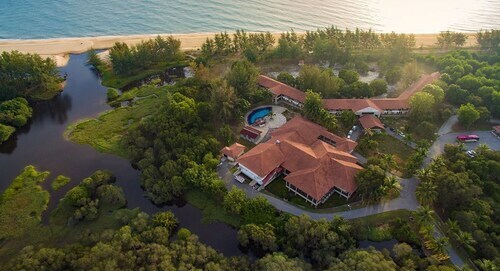 Situated by the sea, this resort is 1.2 mi (1.9 km) from Marine Park Centre and within 3 mi (5 km) of Redang Mosque and Berjaya Beach. 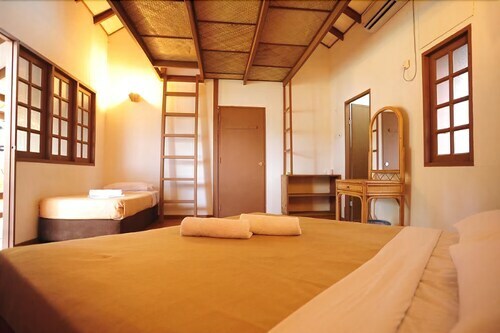 Situated in Redang Island, this hotel is 0.1 mi (0.1 km) from Redang Beach and 3.1 mi (5 km) from Marine Park Centre. 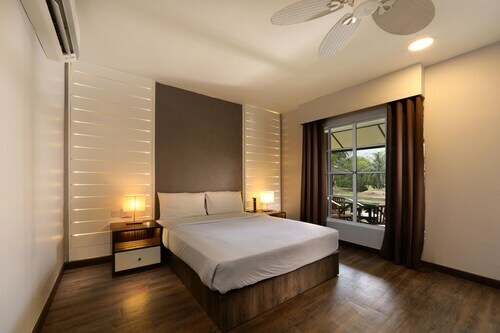 Situated near the beach, this resort is 0.1 mi (0.1 km) from Sutra Beach and within 6 mi (10 km) of Merang Jetty and Institut Teknologi Petroleum. Pagar Besi Beach and Batu Rakit Mosque are also within 9 mi (15 km).